Residents in the Philippines' Cagayan Bay in the northern part of the country first spotted an ailing whale swimming lethargically half a kilometre from shore. The next day it was swimming even closer to shore, prompting locals to call on the region’s marine mammal stranding network. Rescue efforts, however, to save the 5m-long humpback whale calf came too late. 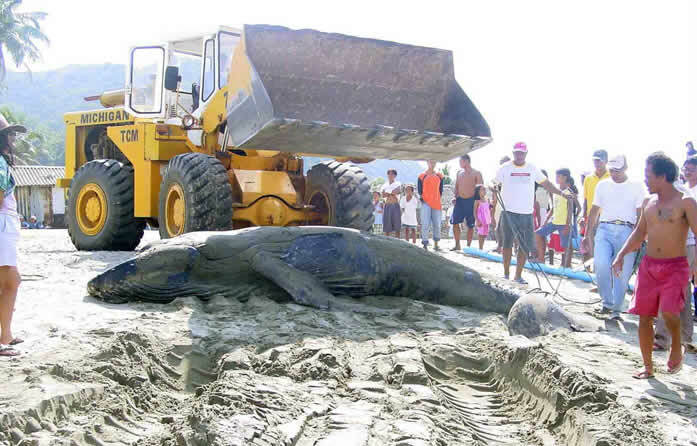 Cagayan, the Philippines – Residents in the Philippines' Cagayan Bay, in the northern part of the country, first spotted an ailing whale swimming lethargically half a kilometre from shore. The next day it was swimming even closer to shore, prompting locals to call on the region’s marine mammal stranding network. Rescue efforts, however, to save the 5m-long humpback whale calf came too late. A rescue team composed of marine authorities and veterinarians was dispatched to help save the animal. Dr Jom Acebes, former manager of WWF-Philippines’ Humpback Whale Research and Conservation Project and an expert in cetaceans, was also called upon to help. The first of two rescue attempts began on 19 May, when people and equipment were brought in. By the next morning, in an unfortunate twist of fate, the ailing whale was entangled in an adjacently-deployed fishing net. By the time the rescue team arrived, the whale had already drowned. The body was carefully towed ashore, photographed, measured and further examined. The male humpack whale measured 5.2 meters in length and weighed in at 1.5 tonnes. Sadly, he became the first documented humpback whale death in the country. A necropsy determined that the animal died from drowning. However, it had been sick — it was badly malnourished and its body infested with parasites. There were also blood clots found in its eyes and head, suggesting that it might have been injured by loud anthropogenic (man-made) underwater noise such as dynamite blasts. Dr Acebes, in collaboration with the UP College of Veterinary Medicine is presently conducting an examination of its tissue samples to determine if this was, indeed the case. The humpback whale (Megaptera novaeangliae) is a keystone species that WWF protects in the Babuyan Isles, an archipelago located in the Luzon Strait and north of Luzon Island in the Philippines. One of the largest of the baleen (as opposed to toothed) whales, mature specimens can reach lengths in excess of 15 metres and weigh in at 35 tonnes. Classified as vulnerable by the IUCN, these giants frequent the northern most portions of the Philippines from January to May of each year. WWF has been doing research on humpbacks since 2001.Through the project’s initiative the provincial government of Cagayan declared the whale a protected species in 2004. Humpback whale carcass being removed from the beach. Cagayan, the Philippines.